Many New Yorkers could not afford the luxury of buying books in the 19th century; and prior to 1880 the few libraries that existed were not open to the public. But that year the Free Circulating Library was incorporated. The response was so great that the sidewalks around the first library—a single room in a building on 13th Street near Fourth Avenue—were blocked. At closing time on one occasion, of the 500 books only two were left on the shelves. David W. Bishop owned a four-story brick apartment and store building at the northwest corner of Amsterdam Avenue and 82nd Street. In 1899 he constructed a one-story structure directly behind it, designed by architect A. E. Westover. The unlikely building pretended to be quite grand, despite its minimal proportions. Its cast iron pilasters supported a pressed metal bracketed cornice. Above this was a Roman-style parapet with a miniature temple. Within its pediment was the date of construction. It was topped by an antefix which added to the classical grandeur of the diminutive building. No doubt the blank space below the pediment held a plaque announcing the Cathedral Free Circulating Library. John Hayes had gotten his wish and No. 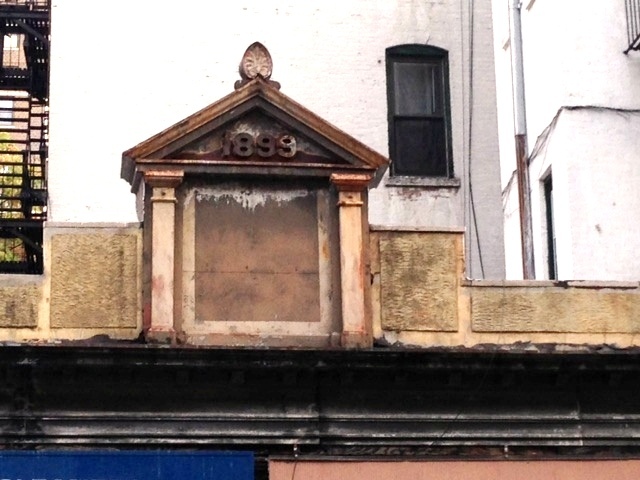 203 West 82nd Street was now one of three Cathedral Free Circulating Library locations. By 1901 the number of volumes lent to Manhattan residents had risen to 342,980. That same year Andrew Carnegie offered $5.2 million to the City of New York to establish the largest free circulating library system in the world. Carnegie’s generous gift may have spelled the end of the Cathedral Free Circulating Library on 82nd Street; but for whatever reason, by the end of 1902 it was gone. 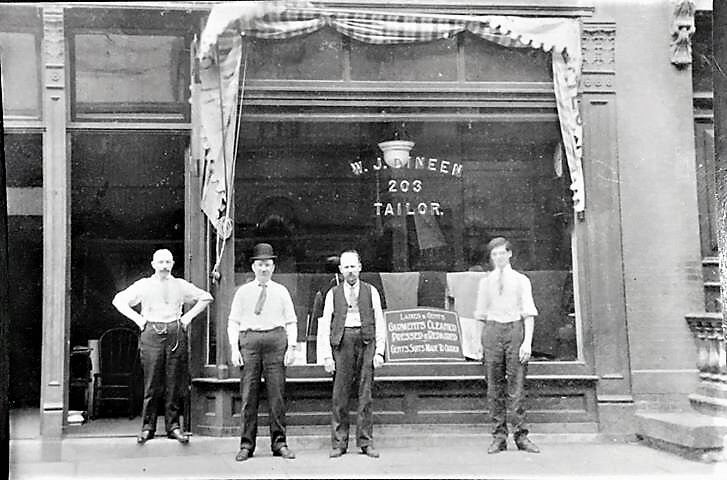 Before long the tailor establishment of William J. Dineen was operating from the eastern storefront. His all-service shop not only created made-to-order men's suits, but provided cleaning and pressing services. William J. Dineen proudly posed in front of the shop with three employees. A ceramic spittoon sits just inside the doorway, a convenience for waiting customers. photo courtesy of descendant Cat Riehl. William Dineen died in 1924 and it appears that the tailor shop was dissolved before or around that time. Falihee and McCaul were investigated, along with scores of other plumbers for violating the Donnelly Anti-Trust law. The pair escaped jail time; but they were fined a significant $2,500 on March 22 1921—more in the neighborhood of $33,000 today. The highly-successful plumbers soon branched out, acting as general contractors and operators. Within a year of the court’s decision, they had formed F. M. Construction Co. and filed plans for a $130,000 apartment building on Shakespeare Avenue in the Bronx, designed by John P. Boyland. It was possibly their expanded business that prompted their need to relocate; but by the mid-1930s Faliee & McCaul had moved on. One of the shops at No. 203 West 82nd Street was converted to a neighborhood grocery store. Out of the Great Depression came desperation; and it may have been that which impelled three teen-aged boys to attempt a hold-up of the little grocery store on the night after Christmas in 1938. Their attempt at robbing the store failed and the boys fled in various directions—one of them running across rooftops to escape. It ended badly. Fifteen-year old David Holmes fell five stories from a tenement building, seriously injuring himself. He and another 15-year old accomplice were arrested and charged with juvenile delinquency. The third boy was older, 17, and was charged with burglary. David’s charges were made in Roosevelt Hospital. Throughout the rest of the century, up until today, the little building has suffered much disrespect. 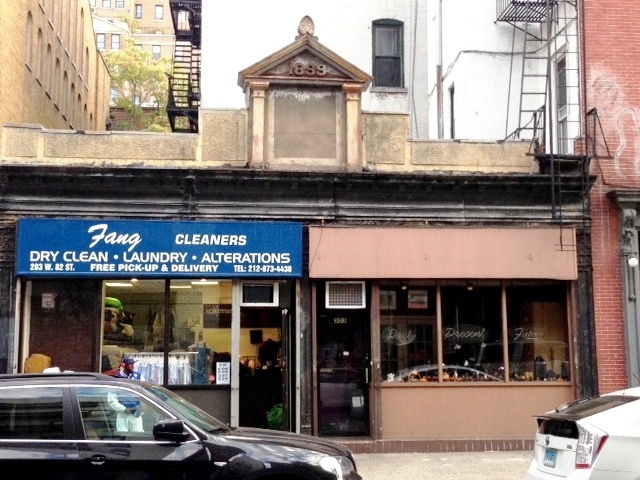 Today, separated into two shops, it is home to a cleaners and a second hand store. And yet No. 203 West 82nd Street refuses to be ordinary, maintaining its rather haughty air.